In an age of robotic press conferences where players are staying focussed and taking it one match at a time, Naomi Osaka breezes in, confesses to being fond of sweating, eating 500 bagels a day and having only one friend. It’s all peppered with liberal doses of ‘likes’, ‘you knows’ and ‘stuff’. 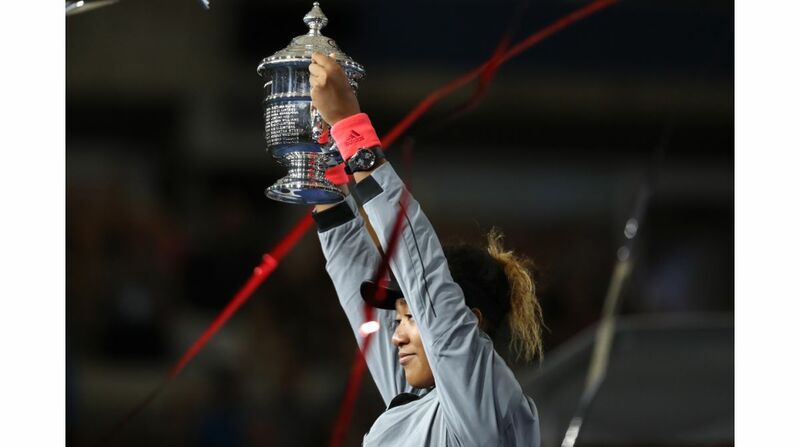 And it made her the breakout star of the 2018 US Open where on Saturday she became first Japanese to win a Grand Slam title with a 6-2, 6-4 win over childhood idol Serena Williams in a controversial final. “It was always my dream to play Serena in the US Open finals,” she said before turning to the American on the trophy podium. Osaka wasn’t even two years old when Williams won the first of her six US Opens in 1999. Born on October 16, 1997 in — appropriately — Osaka, Japan, she was still a year away from moving to the United States on a permanent basis. Her Haitian father Leonard met and married her mother Tamaki having decamped to Japan from New York where he had studied. Now based in Boca Raton, Florida, Osaka has dual Japanese-American citizenship. It’s a status that could help explain what her coach Sascha Bajin describes as her innocence. When Osaka performs media duties with her own national press, she takes questions in Japanese but replies in English, apologising for not knowing the appropriate word when she does resort to her mother tongue. Despite that she is careful not to be seen as disrespectful. “When you go to Japan, everything is totally awesome and you’re having the time of your life,” she says. “Every day you go out and you eat good food and stuff. Despite being a relative rookie on tour, Osaka has developed into a big-stage player. Standing an impressive 1.80m (5ft 11in), she made her Grand Slam debut at the 2016 Australian Open, coming through qualifying to make the third round where it took former champion Victoria Azarenka to stop her. Current number one Simona Halep halted her progress at the French Open in the third round that year while at the US Open, she gave up a 5-1 lead in the final set to lose to Madison Keys, the player she beat to make Saturday’s final. Before this year’s trip to New York, she registered her best Slam run at the Australian Open in January where she made the last 16 and where Halep again proved her downfall. So, it wasn’t a surprise when her first WTA title came at one of the non-Slam’s grandest stages, the prestigious Indian Wells event. Out in the southern Californian desert, she knocked out Maria Sharapova in the first round, Halep in the semi-finals before lifting the title with victory over Daria Kasatkina. In seven matches, she dropped only one set. The following week, she defeated Williams in her opening match in Miami. Like Williams, Osaka has enjoyed a sibling rivalry although nowhere near as intense and barrier-breaking as Serena and her sister Venus. Big sister Mari Osaka is also a professional who this week was playing on the second-tier circuit in Switzerland, losing in the quarter-finals of a USD 60,000 event. Victory on Saturday earned Naomi USD 3,800,000 but she remembers the days when her older sister was the best player in the Osaka household. “When I was practicing with my dad, if my sister wasn’t there, I don’t think I would have made it,” she said. After Saturday, there will be no more arguments in the Osaka household as a new star was born on the WTA circuit.